Hi, first trip of the year, from Punat in Croatia to Zadar. Course roughly SE so of course first day the wind was SE, from 15 to 25 knots. Got just about half way and put into Navalja at dusk, Second day the wind veered gradually to SW so had a 4 hour close hauled on the port tack to within 1 hour of Zadar with winds 9 to 15 knots. Absolutely great sail and mostly under Simrad autopilot, a great piece of kit. However, at some stage the lower vange fitting bent and shattered and I really have no idea why. On day one, things were pretty tight and on the wind all the time so I really can't see how this can happen. Any ideas gratefully received. The same thing happened to me. did not even notice it until we had mored for the day, happened on the second day I had the boat, no false jibs or any sudden maneuvers. Sparecraft dealer in norway blames me. Very curious, and thank goodness I am not alone! Nobody has offered any suggestions at all. also happened to me , they replaced with a new diff type. I replaced it with a identical one, have not happened again even in a lot rougher conditions. I believe it was a material weakness, or damage sustained to it before it was mounted on the boat. Terry, did they offer any comments as to why it might have happened? Do you have any pictures? I'm still claiming a refund under warranty, so any further evidence would help me. I think because it was cast not forged, can't remember which way round. but they made a new one for me and it was a little different. I had a 430 a couple of weeks last year. The same happened to me. I don't know the reason, but we had heavy wind from behind. 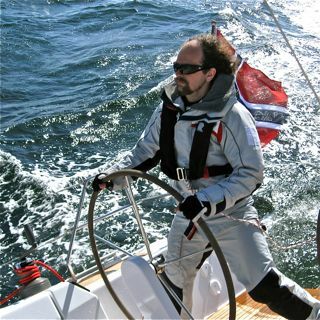 it could be that the wang has hard in, (black down haul on photo) to sail close hauled, and then on following leg, reach/broad reach, the mainsail sheet was hardened, but not the wang. this would bring force and pressure on the wang fitting. This is really puzzling. 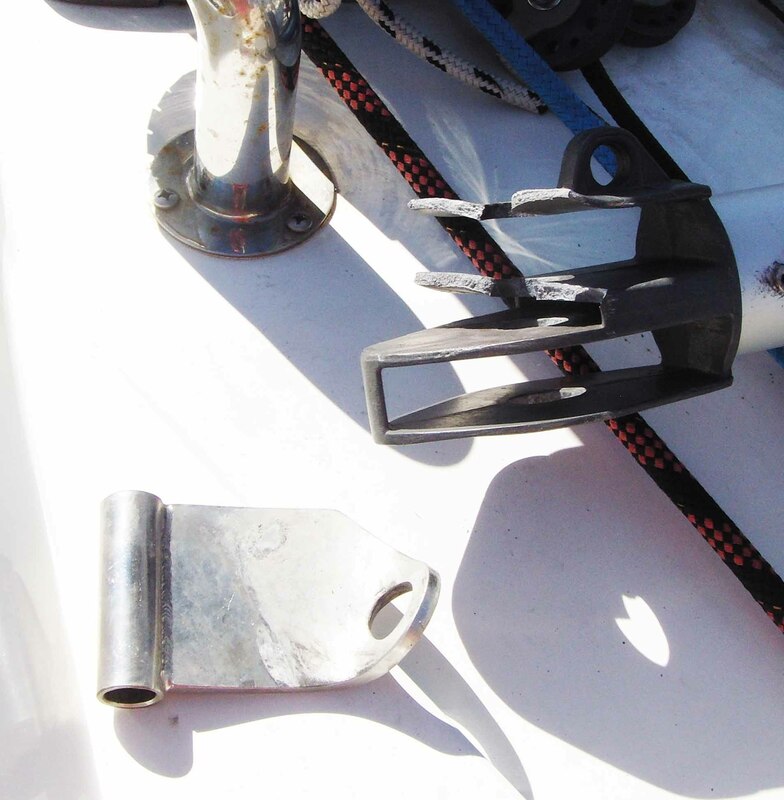 It seems to me that you can't really put much compression force on the vang, and tightening the vang can only put a tension force on the mast fitting, which wouldn't bend it like that. 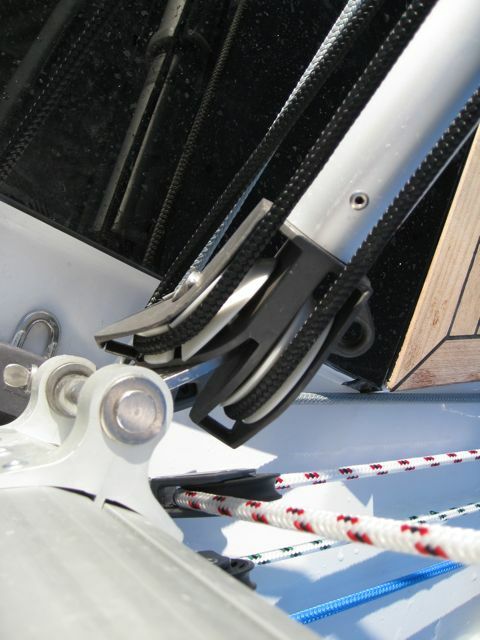 If the boom was allowed to swing far enough forward the mast would eventually interfere with the movement of the vang and that could bend the fitting, but it looks to me like the boom would bump into the shrouds before this happens right? I certainly hope not to figure this out "the hard way"
( and the vang is fully compressed) it will bend the fitting like on the picture.